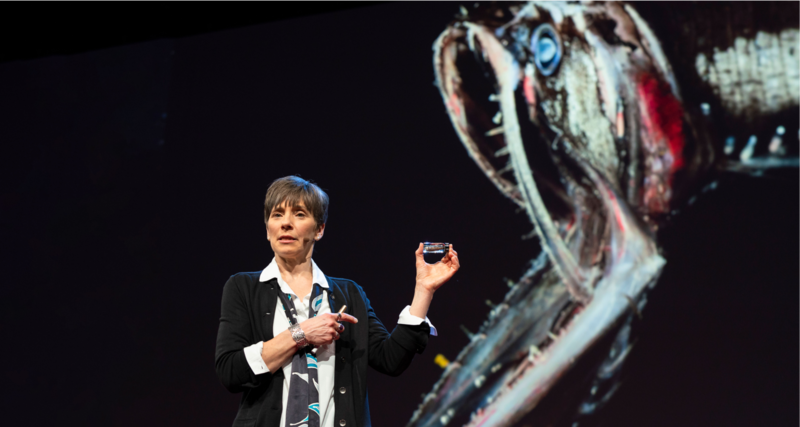 Terrifying but tiny - Projected on the TED stage behind Woods Hole Oceanographic's Ocean Twilight Zone Project Lead Heidi Sosik are the gaping jaws of a bristlemouth, a fish that dwells in the twilight zone. Bristlemouths may look terrifying, but a dozen of these tiny fish could fit in the vial she holds in her left hand. Photo by Bret Hartman, TED. 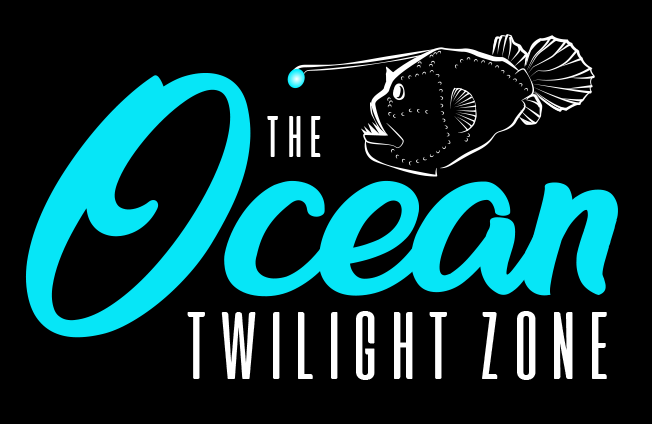 Woods Hole Oceanographic Institution is embarking on a journey to explore and understand one of our planet’s last hidden frontiers—the ocean twilight zone (OTZ), a shadowy region far below the ocean’s sunlit surface. The OTZ project is WHOI’s first major research initiative supported by a new, disruptive funding model: The Audacious Project. Housed at TED, The Audacious Project matches up philanthropic organizations and individuals with highly innovative projects designed to inspire large-scale positive change. In the spring of 2018, The Audacious Project chose the OTZ team as one of its first awardees, connecting WHOI with donors who provided a total of $35 million in support--the largest philanthropic gift in the Oceanographic’s history. 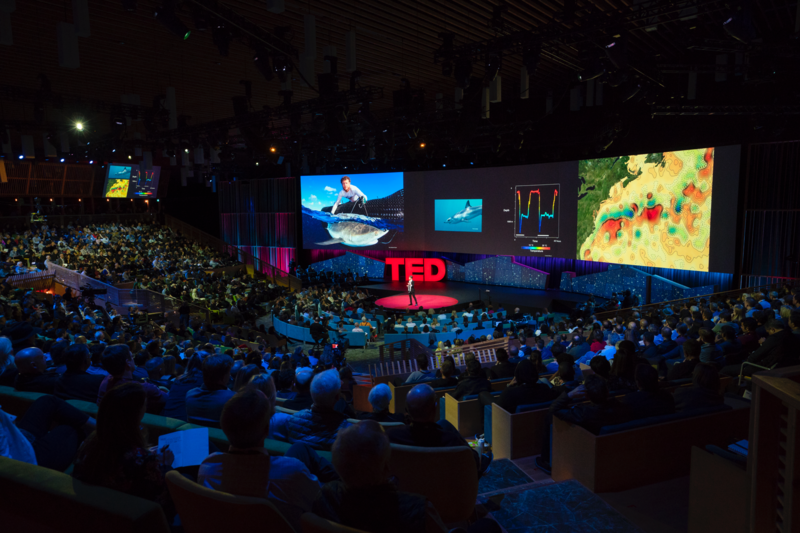 One early benefit of Audacious funding was the opportunity for OTZ project leader Heidi Sosik to deliver a TED Talk at the 2018 TED conference in Vancouver, putting WHOI ocean science on the world stage. Most of the seven world-changing ideas awarded Audacious funding in 2018 are led by social entrepreneurs. WHOI’s is the only one focused on ocean science. Bridgewater Associates founder Ray Dalio is a leading supporter of ocean exploration and media through his OceanX initiative, and he championed WHOI’s Ocean Twilight Zone initiative in the competition for The Audacious Project funding. WHOI board member Tom Tierney says he saw The Audacious Project as an opportunity to get WHOI science and technological innovation some well-deserved attention from potential funders and the general public. Scientists have long studied shallow coastal waters, the sea surface, and even the ocean bottom—but still little is known about the ocean’s midwater: the mysterious twilight zone. Robertson Foundation President Sir John Hood says that needs to change. Woods Hole Oceanographic Institution Biologist and Ocean Twilight Zone Project Lead Heidi Sosik speaks at the 2018 TED conference in Vancouver. There have been over 1.2 million views of her talk in the past year. Photo by Jason Redmond, TED. Craig McCaw of The Craig and Susan McCaw Foundation hopes the project will profoundly increase the quality of research on the role of the twilight zone. Filmmaker and ocean explorer James Cameron has a long-standing partnership with WHOI, which he calls “the world’s leading independent organization dedicated to deep-ocean research, exploration, and education.” Cameron calls the ocean twilight zone “one of the last and most important remaining frontiers on Earth,” and says the need for WHOI to take the lead in exploring it has never been more urgent. Time is of the essence, agrees Tony James, a major supporter of WHOI’s OTZ initiative. The Audacious Project’s philanthropic model of research funding will enable scientists to get more information, more quickly—giving all of us a chance to better understand, appreciate, and protect the ocean twilight zone before it’s too late.